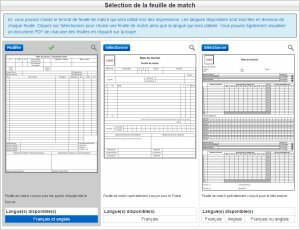 A game sheet has been added to the soccer leagues in Quebec. The game sheet provides a copy to the coaches and officials. In the "Team Management" menu, you now have access to a new "List of registered players." This section allows you to view all registered players and validate the result of a validation of their passport or identification number. 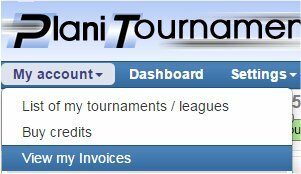 Upon registration of the players, the system automatically makes comparison with the previous tournaments and leagues to give you information on each player. In the general setting, you can now choose in what order will be placed players on the game sheet. 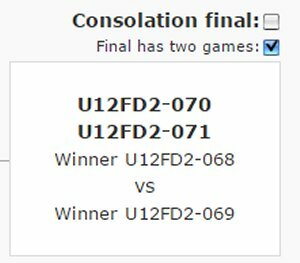 A game sheet was added for ringette tournaments and leagues. 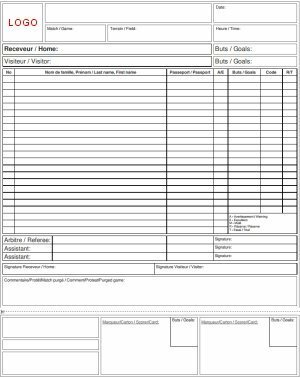 The game sheet complies with the demands of the Federation of ringette in Quebec. In the qualifications games creation, you can now change a game created automatically or manually. 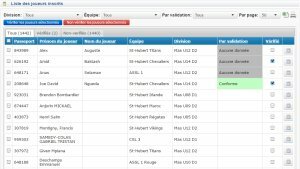 A section was added to the responsable account to see all invoices for purchases made. In the players manager of the team, adding an Excel icon to export Excel team players. 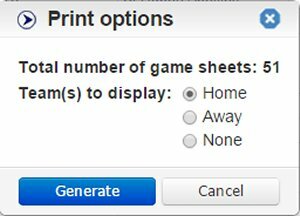 In the Games schedules section, you can now print to a PDF report all game sheets of your tournament or league. When you send schedules to teams or participants, you now have an email preview window that will be transmitted. You can also change before your send. 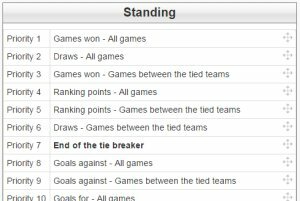 The line "End of tie breaker" has been added in the list of standing priorities to stop the tiebreaker standing at the location you desire. In your playoffs, you can now configure two games at different times during your finals. You can now set a minimum and maximum number of players for each division. In the enter of the results, you can now add a result called "Shootout" to allow the public to know how the game ended. In the results page of the playoffs, the winners list by position is now available for better visibility. 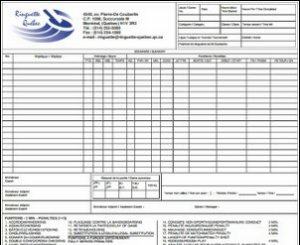 In the configuration of your tournament or league, you can now select the game sheet template you want to use for your tournament or league. If you need a new model game sheet, contact us and we will be happy to add it to the available choices. In assigning games, by clicking on the icon configuration, you can now configure the messages and validations you want to have when assigning your games. 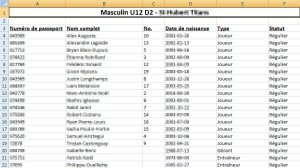 Allow managers to enter scores, statistics and observations for played games. That option is accessible in the Schedule / game sheets section of the teams/participants. In the public section, Visitors will see 2 standing: Approved and not approved. In the fault management section, an icon was added for each fault to open a window with details on the fault as the details of the game. In the assigning games, clicking on "Show checks" you can see warnings directly in non-green cells where it is not advisable to place your match. The club / cities management section was added allowing a league inter-city associate teams and fields for a club / city. 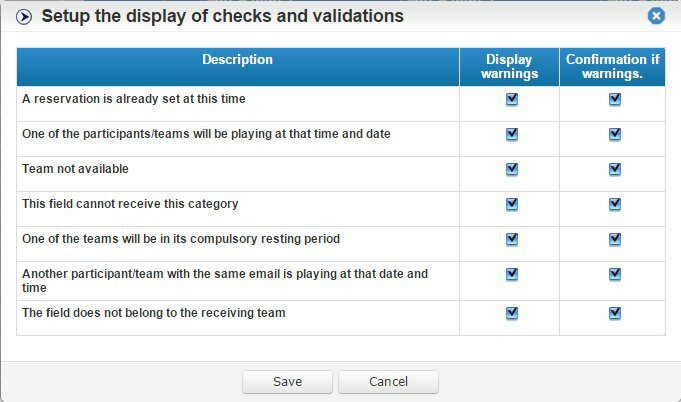 When assigning games, a warning will then be displayed when trying to place a match which the home team is not on his field.